What to wear to Oktoberfest: Lederhosen! Okay, so first things first—if you don’t know what “Oktoberfest” is…read more about Oktoberfest here. Then check out our list of Oktoberfests around the world and decide which ones you’ll be attending. Now we can focus on the perfect wiesn outfit for the men. Ladies, check out our article on how to pick out the perfect dirndl for Oktoberfest. Lederhosen literally means leather pants in German. 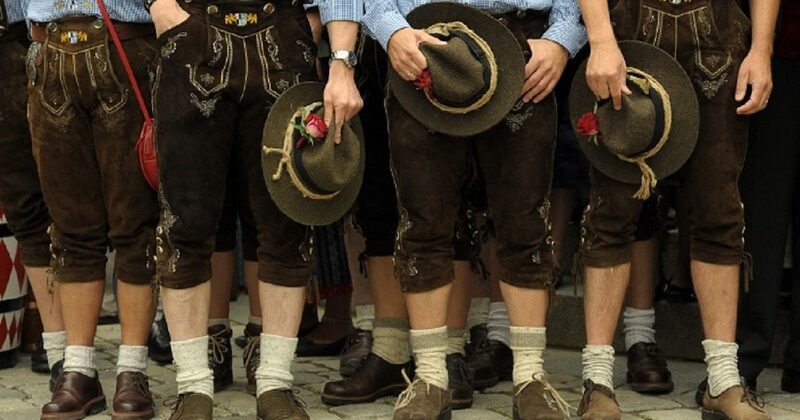 Contrary to common belief, they are no longer the everyday pants that most Bavarian Germans wear, but as part of a rich, cultural tradition, they are still a common sight at traditional events like Oktoberfest. Other names for Lederhosen outfit are Bundhosen or Kniebundhosen. Want to attend an Oktoberfest? Check out these Oktoberfest events around the world. You may be tempted to buy the cheap, touristy knock-off Lederhosen, but we highly recommend if you’re going to do something then do it right. Germans are really serious about their cultural heritage and often see the cheap ones as a mockery. The real thing may be expensive, but they are excellent quality and will last you for several Oktoberfest events. They are usually such good quality that your children and their children could probably wear them as well. Whether you decide on long or short lederhosen, hat or no hat we hope you enjoy your Oktoberfest.